This is the first of two posts about the newest animal to be featured during a Live Animal Presentation at the New England Aquarium. Learn more about LAPs, or Live Animal Presentations, in this behind-the-scenes post. Behold the Eastern Box Turtle (Terrapene carolina carolina), our newest LAP animal! This type of turtle is one of only two species of box turtles found in the US (the other is called ornate or western box turtle) and it is also the most common terrestrial turtle found in the eastern half of the US. Box turtles are unique for their highly specialized super-duper protective shell. The plastron has a hinge that can close up like a door so that its legs, tail, head and neck can be safely tucked inside out of a predator’s reach. 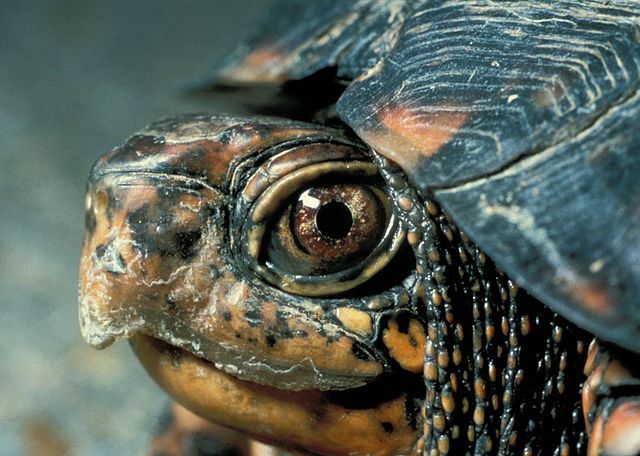 Box turtle predators include skunks, raccoons, minks, dogs, snakes and rodents. Although these turtles have the unique hinged protection the population of predators is booming, increasing the chance of turtle predation. Predators such as raccoons, skunks, and rodents are benefiting from the availability of additional food sources such as garbage, bird seed and pet food. Box turtles have a varied diet including insects, worms, slugs, lizards, berries, vegetable matter and carrion. They can even eat mushrooms that are toxic to humans. In fact, some folks have been poisoned by eating the flesh of box turtles that consumed toxic mushrooms. These turtles are also famous for their impact on the germination of the may-apple plant. May-apple seeds ingested by turtles have about a 38% germination rate, whereas un-digested seeds only have an 8.5% success rate. Box turtles, which are the may-apple’s main seed distributors, are able to reduce the thickness of the seed coat allowing germination to take place more easily. The may-apple root is being studied to use as a possible treatment for cancer. 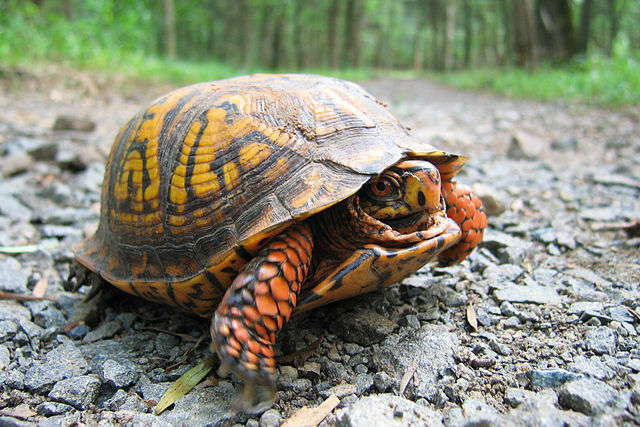 Habitats Box turtles are often found in forests, fields, thickets, marsh edges and bogs. When they’re feeling adventurous, they sometimes travel to shallow water at the edge of ponds and streams. In the heat of the summer, these turtles will wedge themselves into the soil surface to help retain moisture while they rest. In winter, box turtles hibernate in loose soil at a depth of about 2 feet, or sometimes under leaf litter, stump holes or mammal burrows. Box turtles have developed a tolerance for freezing similar to wood frogs, where the liver production of glucose acts like antifreeze. They are capable of surviving gradual partial freezing for a few days, but a sudden cold snap could kill them. 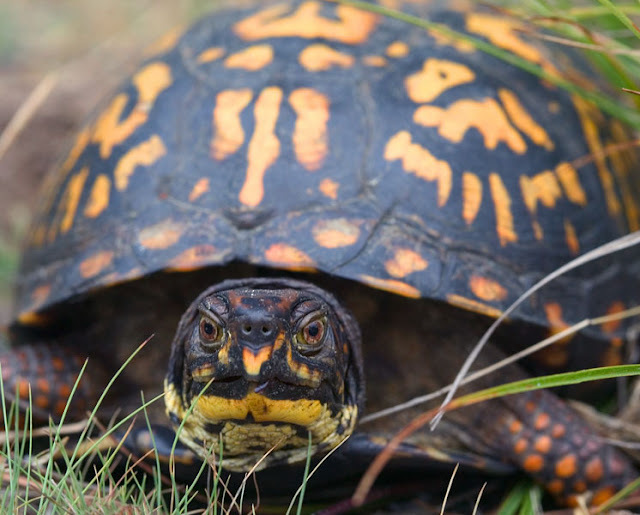 There much more to learn about the Eastern box turtle, like some of the challenges they're facing in the wild and what you can do to help them. Stay tuned for Part II of LAP: Eastern Box Turtle!